In this report, we document the results of network measurement tests we ran to determine how the Internet is being filtered in Iraq in reaction to ongoing insurgency in the country. The results identify 20 unique URLs that are blocked on three Iraq-based Internet Service Providers. These websites include social media platforms (such as Facebook and Twitter), proxy / circumvention tools (such as Psiphon), and the websites of mobile messaging apps (such as WhatsApp and Viber). Notably, none of the 7 websites we tested that are affiliated with, or supportive of, the jihadist insurgent group the Islamic State in Iraq and Greater Syria (ISIS) were found to be blocked. The ongoing insurgency within Iraq continues to escalate. In recent weeks, the jihadist group, the Islamic State in Iraq and Greater Syria (ISIS) seized control of the northern provincial capitals Mosul and Tikrit and Iraq’s largest oil refinery. The conflict has led Iraqi Prime Minister, Nouri al-Maliki, to formally request the U.S. military to engage in air strikes to limit the ISIS advances. A letter allegedly leaked from the Ministry of Communications details these outages, indicating the ISIS-held provinces in which Internet access was to be blocked completely. In addition the letter lists websites and platforms (which included Facebook, Twitter, YouTube, Viber, Skype, and others) to be blocked. ISIS actively uses social media to spread its messaging. For example, the group introduced an Android app in April 2014, called The Dawn of Glad Tidings, which leverages Twitter users’ accounts to share ISIS-related tweets. 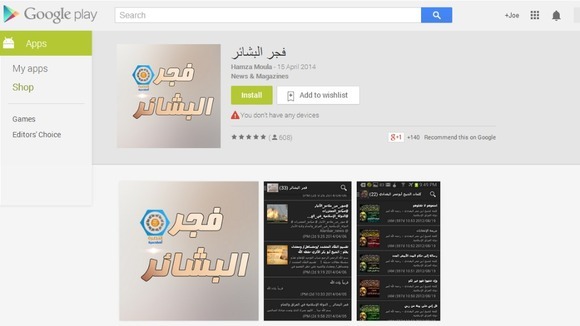 The application was removed from the Google Play store for violating community guidelines. The group also uses well coordinated hashtag campaigns to spread their message, and had their Twitter account shut down after a number of graphic photos of victims attacked by ISIS were shared. Complete shutdown of the Internet during political crises have been seen in numerous other countries in recent years, including Egypt and Libya during the 2011 Arab Spring and in Syria during the ongoing conflict in the country. We have documented the ways in which sensitive political events, ranging from violent conflict to elections and the hosting of international events, lead to changes in the application of information controls. 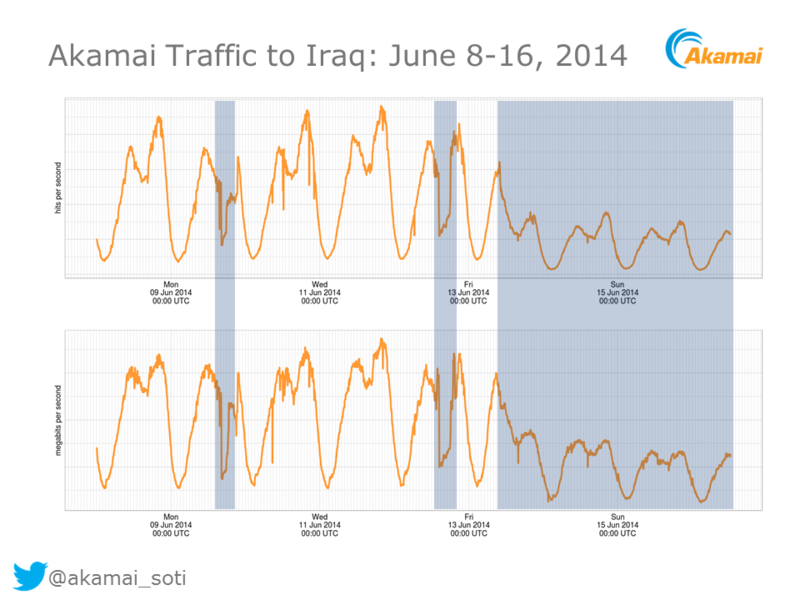 We used two methods to determine if and how filtering is being applied in Iraq. The first method performs remote lookups of DNS records to identify suspicious results which could be indicative of filtering. The second method undertakes remote testing of website accessibility through proxies. We wrote a script that performs a GET request of a list of websites through six different publicly accessible proxies located in Iraq. We then compare the results of these GET requests with attempts to access the same URLs from the University of Toronto network to identify instances of blocking. 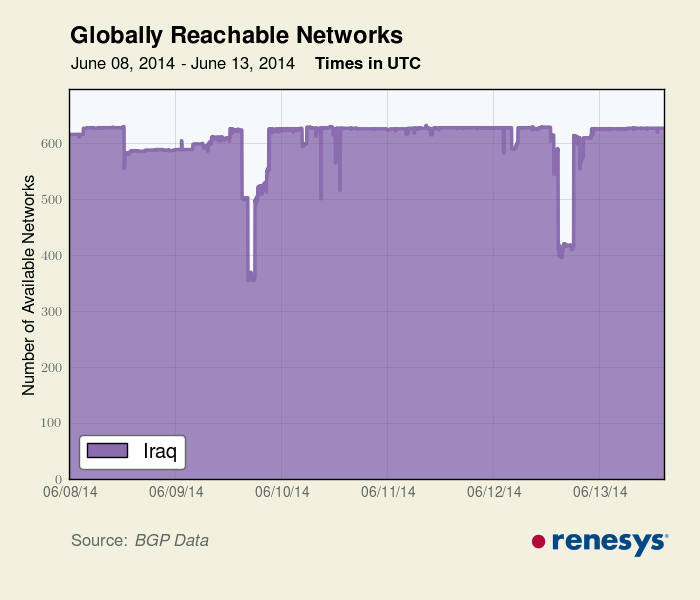 Early reports from Iraq suggested that blocking was performed on some ISPs through DNS tampering. DNS converts domain names (such as “citizenlab.org”) to an IP address (74.208.36.253). If the information in DNS records is tampered with, domain names can resolve to an incorrect IP address, which can lead visitors to a blockpage. In some cases, it is possible to perform lookups of the DNS records used by Iraq-based ISPs remotely, without being connected to that ISP directly. After performing these DNS lookups, we are able to compare the results for a given domain name with what we would expect to see to identify aberrations. We performed a lookup of a list we compiled of 1,358 URLs to identify suspicious DNS results. We also did GET requests for the URLs on this list on the publicly accessible proxies we found in Iraq. This list contains content ranging from international news sites, social media platforms, and content specific to Iraq’s domestic political, social and cultural context. A full list of URLs tested can be found in the Data section. This result is unexpected. It is abnormal for a domain name to resolve to an IP address that is not publicly routable. We tested the same list of sites through six Earthlink proxies from June 16 to 20, 2014. When accessing some sites we are redirected to the same IP address (192.168.222.66) and presented with the blockpage pictured in Figure 6. Although there was some variability between sites found blocked on the six proxies, the following list of domains were found blocked at least once on one of the proxies, over the four day period. In addition, when accessing this IP address (192.168.222.66) directly in a web browser, we also see the blockpage pictured in Figure 6. Figure 7: A side-by-side comparison of accessing the same Amazon EC2 URL in Canada and Iraq. Given that the content of this URL is benign it is likely not being targeted for blocking. This block is more likely to be the result of an overzealous filtering pattern used in the configuration of the domain name server. There were no suspicious results found in tests of the nameservers of this ISP. This result was expected, because this ISP serves the Kurdistan area, and reports have indicated that the shutdown and social media blocking orders did not include Kurdistan. 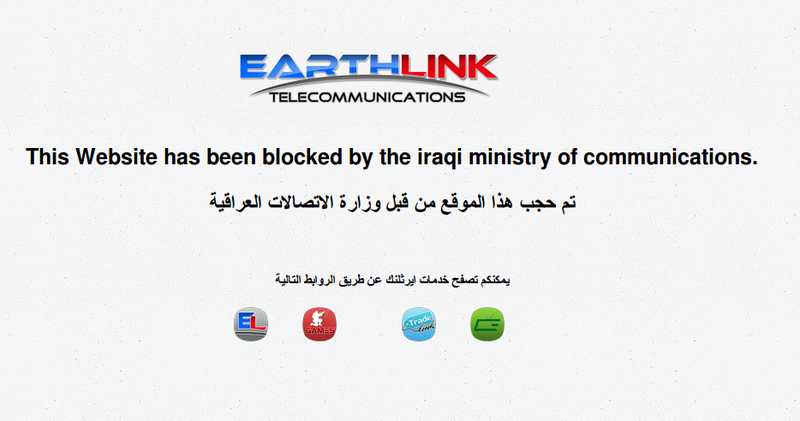 The websites our tests found to be blocked represent a small number of content categories, and generally correspond with the list of sites ordered to be filtered by the Iraqi Ministry of Communications. We also tested the accessibility of 7 URLs of sites which are affiliated with or supportive of ISIS. We did not find any evidence, through both DNS lookups and proxy testing, that any of these URLs are blocked. Given that the insurgency was cited as the rationale for the shutdown and filtering, this finding is curious. In many cases Internet filtering implemented by DNS tampering is straightforward to circumvent. Users can simply select an alternate DNS service that will perform name resolution correctly. However this circumvention method can also be manipulated by censors, as seen recently in Turkey where providers intercepted requests to Google’s public DNS servers in order to prevent censorship circumvention. We have received anecdotal reports from users located in Iraq that using Google’s public DNS servers did not circumvent censorship, suggesting that DNS requests are being hijacked. However, circumvention services have reported increased usage from users based in Iraq. 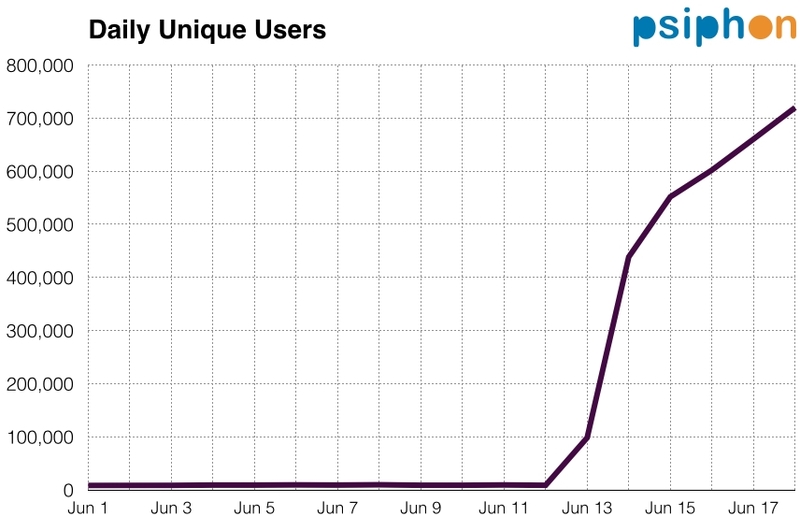 The circumvention service Psiphon reports a significant increase in users connecting from Iraq starting from June 13 after social media platforms were blocked, as seen in Figure 9. Note that 97% of these users are connected to Psiphon through their mobile phone using the Psiphon Android application. 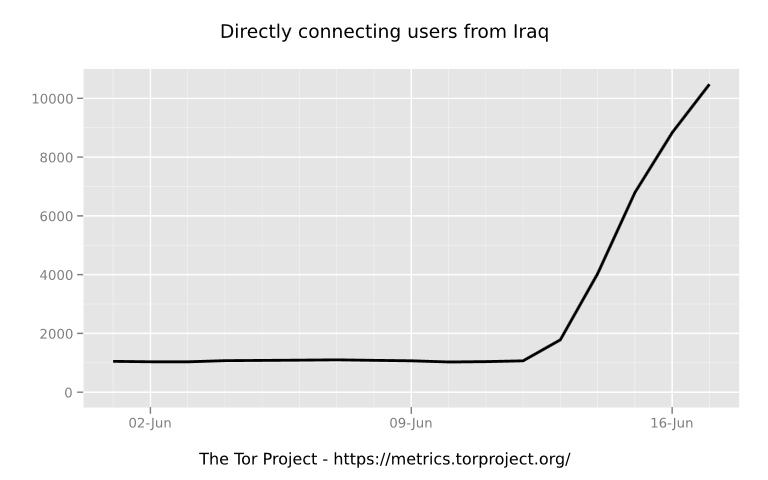 Figure 9: Daily users of circumvention tool Psiphon in Iraq in June 2014. Given the volatile situation in the country, it is uncertain how Internet accessibility will be further affected. The Citizen Lab will continue to monitor the situation and post updates to our findings. A full list of data from these tests can be found at our GitHub repository. Jakub Dalek, Adam Senft, Helmi Noman, and Masashi Crete-Nishihata undertook research and writing of this report, supported by the Social Sciences and Humanities Research Council (Canada) Grant 430-2014-00183, Prof. Ronald J. Deibert, Principal Investigator. Media coverage of the report includes VICE’s Motherboard and The Daily Beast.